Immediately after you enter the case, you can start working on documents. In the Documents (1), you can create new folders, drag&drop documents in it, launch a click on an edit button to launch edit in MS Word application. You might also check the Time schedule (2) that shows all the upcoming tasks and reminders. Case progress (3) gives you a handy overview of what is going on - anybody edited a document few days ago? Any new e-mail or physical mail? Add a note to quickly track progress. Each case has a dedicated Case mailbox (4) where you will keep track of all the conversation. 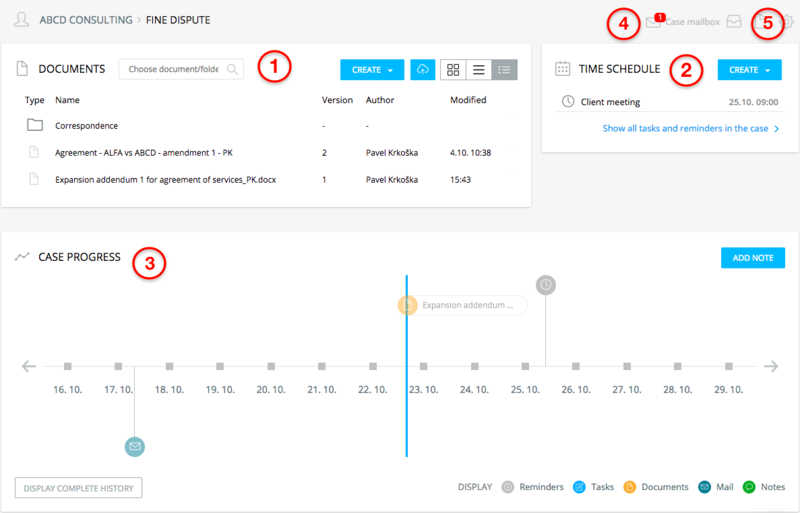 Icons in the top-right corner gives you quick access to time sheets, invoices and case settings (5).